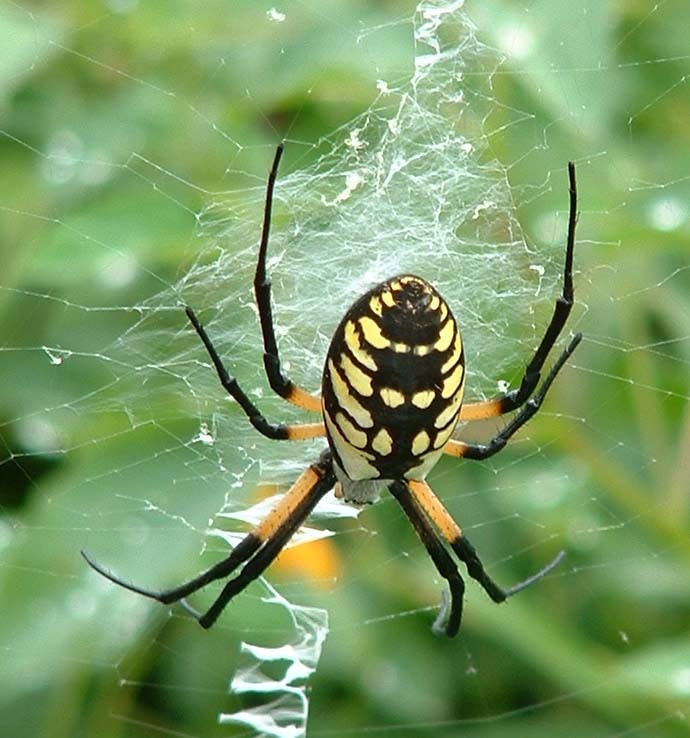 This is a black and yellow argiope aurantia spider. It is setting up housekeeping on my red clover. It makes a perfectly round web. I notice it every morning when I water. Sometimes I will give it a little misting just to see the beautiful web pattern. It always has 3 or 4 insects neatly and tightly wrapped up in certain spots on its web. A very uninteresting and slightly intrusive neighbor was strolling through my garden and gave out a shriek. As I looked out the window I saw her starting to take a swing at the web with a handful of Thursday ads she just collected from the mailbox. I yelled out the window,” Let it be, it is fine right where it is.” When I got outside she was very agitated. “You have to get rid of that thing. It is going to bite someone.” I assured her that it was not going to bite anyone it was harmless. “Well, said she, what is it called?” As if knowing its name was going to make some sort of difference in her intent. When I lived in Anaheim next to an orange grove I would see these spiders all the time. They would spread their webs from one tree to another. I was always amazed at how perfect they were. My dad always told me, spiders that make pretty webs are not poisonous, and spiders that make ugly webs are. Black widows made ugly webs and they are poisonous. So it must be true. I was never afraid of the spiders that made pretty webs and always found them very fascinating.These black and yellow guys were very serious about catching anything and everything that crossed its path. Their webs were very strong and could catch butterflies and slow down an 8-year-old running through the grove. I never knew what they were called, until now, so to answer my spooked neighbor’s question I just said, “it’s an orange grove spider and it’s harmless.” She seemed satisfied with that answer and left mumbling a bit. I was just glad she left. What I really wanted to do was to tell her to stay out of my garden.